With the growing number of apartments made exclusive to short-term rentals on sites like Airbnb and VRBO, San Francisco is faced with a housing crisis. While some might suggest that having more short term rental units available is great for SF’s tourism economy, the trend has been associated with a decline in available affordable housing in the city more broadly. Although laws exist to regulate the short term rental economy, very few of these laws are enforced with regard to online travel marketplaces. In order to fill the legislative gap, Prop F was designed. Establishment of a specific complaint process around enforcing these requirements. The bill is focused on short-term rentals of residential units, or rental models for housing where the term is less than 30 days. 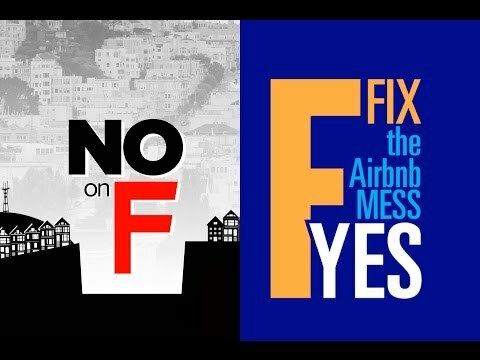 Proposition F states that “the purpose of these limits is to prohibit converting rental units from residential use to tourist use and help preserve the availability of housing in San Francisco”. Only “permanent residents" (people who have occupied the unit for at least 60 consecutive days) may offer residential units for short-term rent (and may only do so after registering the unit with the City’s Planning Department). Under Prop F, these registered properties may not be rented on a short-term basis for more than 75 days per year. Current laws allow these units to be rented “unhosted”—that is without the resident living there during the rental period—for 90 days. “Hosted rentals” (where the resident is present for the duration of the rental) are allowed for an unlimited number of days each year. Under current law, an individual can rent out an extra bedroom all year long if they so choose. Under Prop F, this would no longer be the case. Hosting platforms, such as AirBnb and VRBO, would have to stop listing a unit once the 75 day quota is reached. Prop F would also prohibit the short-term rental of “in-law” units (an additional living space on the same property). Finally, if Prop F passes, “interested parties” will have the ability to sue any violators (or wrong-doers). “Interested parties” include people who live within 100 feet of the unit, the owner or the unit, and any housing non-profit organization. Who Wins and Loses with Prop F? Short-term rentals can drive up housing in an already sky-high housing market in San Francisco. If tourists are willing to pay a premium price on properties in the short term, why would property owners be interested in making their units available at more reasonable prices in the longer term? To make matters worse, there are nearly 10,000 homes in San Francisco that are listed as short-term rentals. That means that almost 10,000 homes are NOT available for full-time SF residents. With consistently high demand, a dwindling supply puts pressure on the market and forces prices up even further. The current situation is tough on property owners. The average property owner is within his rights to rent out a home that includes an in-law unit for a year, at a good rate. However, there is nothing stopping his tenants from renting out the in-law apartment (or rooms within the home) once they have stayed for 60 days. Prop F protects extended stay hosts from the risk of unsanctioned subletting, preserving their investment properties and the experiences they’re looking to create for their guests. Moreover, the pivot away from short-term housing raises demand for alternatives—alternatives like extended monthly stays for traveling consultants, experiential travelers, and other segments of the market base for extended stays. For all their arguments about keeping communities together and for patience in waiting for existing laws to find their bite, Airbnb and other short-term listing sites are fighting an uphill battle against Prop F.
Many of their claims fail to address the urgency of Prop F’s proposed solutions, and while the planned law does require landlords to provide quarterly reports to the City Planning Department on the status of their residences, this downside is an inconvenience at worst. For better or worse, the tide is shifting against Airbnb and their contemporaries. A smart investor would put their money on an alternative that’s better for the SF housing market, and out of Prop F’s “line of fire. With the steadily growing number of people betting on extended monthly stays, it’s no secret what that alternative is shaping up to be.